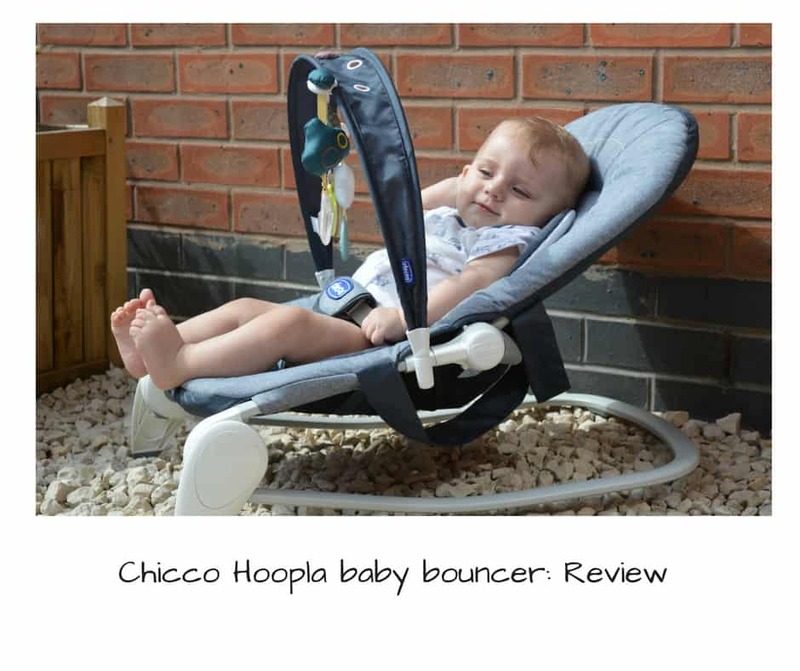 We have recently been sent the Chicco Hoopla baby bouncer to review from Kiddies Kingdom . I know what you’re thinking a bouncer but your youngest is 8 months old . 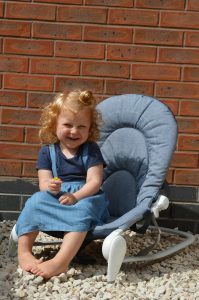 Well this bouncer isn’t just for babies it can be used with children up to 18kg as a chair . Now you know I’m a lover of products that have multiple uses. So this is a big plus for me. We did have a bouncer for Alby when he was younger but he really didn’t like it. I’m not sure why as it was the same one we had for Ava and she loved it. 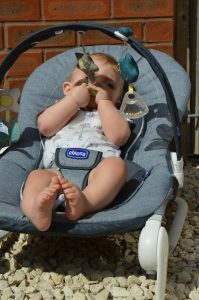 The Chicco Hoopla baby bouncer however he has been loving. With the hot evenings Alby has been going to bed a lot later as he just wont settle. So instead of him crawling around the place not chilling out for bedtime I put him in the bouncer. He is so happy and content in it and even at 8 months he still fits in it fine. He just looks so comfy in it and a lot of the time he does actually fall asleep in it. 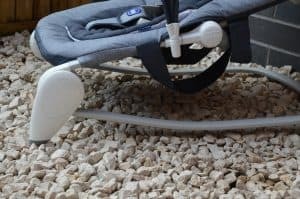 The Chicco Hoopla baby bouncer has a Toy arch on it like most bouncers. It does come off pretty easily which in one hand is great as it means you’re not wrestling with clasps and things to get it off. Then on the other hand Ava can get it off really easily. Which isn’t great when her brother is trying to play with the toys and she decides she wants it instead. I do really like how the toys can slide along the bar they call it a SlideLine system. This does mean that they don’t pull the toys of the arch. Which is what Alby used to do with our other one. You can also push the toys through the holes on the arch so they are unable to move. This may be better for younger children who haven’t quite got their hand eye co-ordination skills spot on yet. I really like the fact that you can either bounce it or pop the legs up and its stays still. This is great for when using it as a chair. Or if you’re trying to stop an older child bouncing baby when they are asleep. The frame itself actually is really good, it’s strong and sturdy. There are three different seating positions which means it’s great for children at different ages. When they are new-born I could see this being used instead of a Moses basket as it does recline fairly flat. Then when babies like to see what’s going on a bit more but aren’t strong enough to sit more upright there is a position for this. Then lastly is the more upright position this is the position you would use if older children are using it. Or I have fed Alby in it like this and it’s a great chair for feeding. 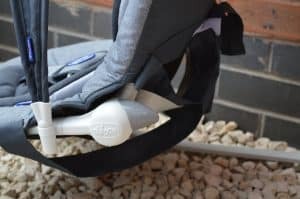 The baby insert on the seat is lovely and soft and both that and that main fabric can be removed and popped in the wash. There are also handles on the back of the chair. That make it easier to be picked up and moved around when not in use. 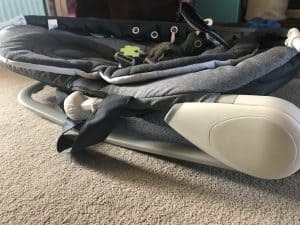 The chair does flattened pretty flat which is great for storage so you can pop it away when not in use if your short of space. To secure baby into place there is a safety harness with a padded crotch strap. I did find this a bit fiddly and found that their wasn’t a lot of length in the straps even after releasing them to their full lengths . Overall I thought this was a lovely bouncer. It is bigger than your normal bouncer but I thought Alby looked a lot more comfier in it with the added room. It does flatten down pretty flat so it can be put away when not in use. Which is handy if your short on space. The straps I did find a little tricky but this hasn’t stopped me from using the bouncer at all. It also requires no assembly which for me is great as I hate putting things like this together. As I always worry if I haven’t done it right. I love the fact that it can be used as both a rocker and a chair. I have used it on many a different surfaces and it hasn’t slipped at all. The rubber padding on the bottom makes sure it stays in place. 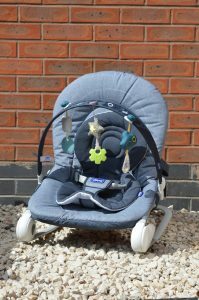 At the time this post was written you can get your hands on the Chicco Hoopla baby bouncer in Dark Grey from Kiddies Kingdom for £44.95. 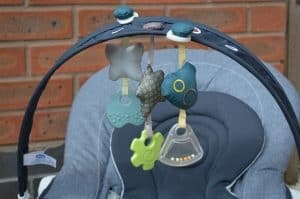 Kiddies Kingdom stock a whole range of different products for children and babies. Think of something you may need for your little one and they are sure to have it. 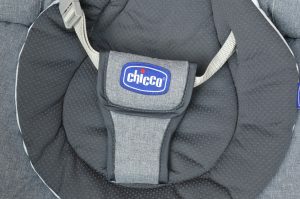 You can also get things like baby travel systems from Kiddies Kingdom too.